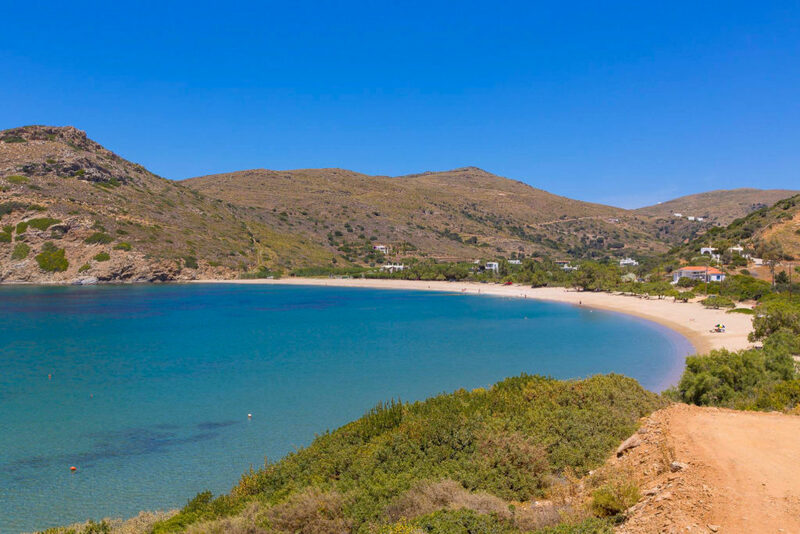 Fellos Beach is a beautiful, long and sandy beach located in the northwest of Andros, in the homonymous cove, just after the village that bears its name. Although relatively remote, depending on where you are, it is worthwhile to visit. You will be rewarded with a unique swim. 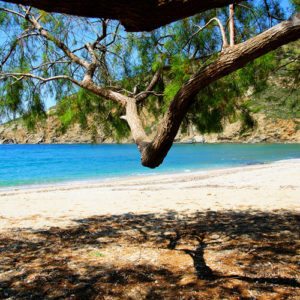 If you live in the area of Gavrio or Batsi, Fellos Beach is not far away. Its only 4 km away from the port of Gavrio port and the access is easy. The road that you will get you there is asphalted. Fellos Beach is ideal for swimming. It has crystal clear and clean waters. It is perfect for games by the sea since it offers a soft sandy coast. It is ideal for rest after the games and a nap in the shade since dozens of trees protect from the sun all day long. Fellos Beach is the beach that is suitable for fish. Fish to catch and fish to eat. It is ideal for fishing and preferred by many fishermen, as well as Selki and Kourtalis. The two small and isolated beaches that are close to it are inaccessible from the land, which fishers appreciate in particular. Okay if you do not catch anything there is a solution. At Fellos Beach one can enjoy food by the sea, in the well-known tavern “The Steki of Andreas”. Fresh fish, squid, shrimp, octopus amongst other grilled and cooked dishes are served. Of course, it’s not just about the fishermen who have to eat to continue fishing. It is for every swimmer who wants to eat, in order to return to the beach and enjoy it to the fullest. Take a look at the beautiful waters with the small fishes that appear in the clear waters of Fellos beach.